Original Editors - Kara Casey and Josh Rose from Bellarmine University's Pathophysiology of Complex Patient Problems project. Diabetes is caused by a problem in the way your body makes or uses insulin. Insulin moves blood sugar (glucose) into cells where it is stored and later used for energy. There are two main types of diabetes: type 1 and type 2 . Type 1 diabetes is also called insulin dependent diabetes mellitus (IDDM), whereas Type 2 diabetes is also called adult onset diabetes or non-insulin dependent diabetes mellitus (NIDDM). Diabetes is a chronic condition that affects how the body metabolizes glucose. When you have type 2 diabetes, your fat, liver, and muscle cells do not respond correctly to insulin, known as insulin resistance. As a result, blood sugar does not get transported into these cells to be stored for energy and builds up in the bloodstream; this is known as hyperglycemia. In a healthy person, blood glucose levels are normalized by insulin secretion and tissue sensitivity to insulin . With Type 2 diabetes, the mechanisms become faulty; the pancreatic beta-cell, which releases insulin, becomes impaired and tissues develop insulin resistance. This pathology has a genetic link, although it is somewhat unclear. According to the International Diabetes Federation (2014), 8.3% of the population or 387 million people are living with diabetes worldwide. Diabetes prevalence increases with age across all regions worldwide and income groups. This number is expected to increase by 205 million by the year 2035. Diabetes is most prevalent in people aged 60-79 years, with 18.6%, though those aged 40-59 have the highest number (184 million) of people living with diabetes. Socio-economic status plays a role in diabetes prevalence. The majority of diabetes incidence (74%) occurs in people over 50 years old in high-income countries, but the majority (59%) occurs in people under 50 years old in low- and middle-income countries. According to the World Health Organization (WHO; 2015), 90% of people with diabetes have type 2. Additionally, there has been an increased prevalence of type 2 diabetes in children and adolescence. There does appear to be a correlation with type 2 diabetes and socioeconomic status, where the more deprived an area’s population is, the higher the incidence of type 2 diabetes is seen. A study by Guariguata et al. (2014) looked at global estimates of diabetes in 2013, revealing 74% of diabetes occurrence in high-income countries happens with individuals over 50 years old, whereas 59% of diabetes occurrence happens with individuals under 50 years old. The results for youth do not appear to be much different. A study by Pettitt et al. (2014) in the United States of America found higher occurrence of Type 2 diabetes for youth <20 years old in American Indians/Alaskan Natives (0.63/1000 people), Blacks (0.56/1000 people), and Hispanic (0.40/1000 people) in comparison to Asian/Pacific Islanders (0.19/1000 people) and Non-hispanic whites (0.09/1000 people). blurred vision due to the lens of the eye becoming dry. In type 2 diabetes hyperglycemia is when the blood glucose levels become very high and it can cause the main symptoms displayed in diabetes, extreme thirst and excessive and frequent urination. In the past there has been large focus on the effects of Type 2 diabetes on the cardiovascular system, nephropathy, neuropathy and retinopathy. However the effects it has on the pulmonary system has been overall, weakly researched. It was shown by Aparna (2013), in line with the findings of Lange et al (1989), that the pulmonary capacity of those with type 2 Diabetes is significantly reduced. Due to the changes in collagen and elastin through type 2 Diabetes, this is likely partially the cause of pulmonary complications in those patients. It is suggested that detecting pulmonary complications through spirometry readings may in fact precede the diagnosis of type 2 Diabetes. Given the research at hand at this time it would be prudent to establish spirometry tests to assess the magnitude of the lung function available. It is shown that spirometry tests to establish pulmonary function may be one of the easiest and earliest measurable factors in those with diabetes. The following disorders can also be seen in adults with type 2 diabetes, but are the ones most commonly seen in adolescents who have the disorder. There are two main types of tests for diabetes diagnosis. A test known as A1C is considered by some to be the gold standard for diabetes diagnosis. According to the National Diabetes Information Clearinghouse (NDIC; 2014), the A1C provides information to determine blood glucose levels over the past three months. Having such data over months provides clear advantages over fasting blood glucose measurements. For example, A1C does not require patient fasting, A1C markers offer stronger correlates to diabetes, and A1C is a good predictor for cardiovascular events, whereas fasting blood glucose levels are not. However, fasting blood glucose tests do offer practical benefit. For example, glucose testing is readily added to laboratory analysis tests that already require fasting. Additionally, A1C is not available in lots of areas and is more expensive than fasting blood glucose tests. Cost and ease of administration must be considered given diabetes increased prevalence within low- and middle-income countries. Random blood sugar test. A blood sample will be taken at a random time. Blood sugar values are expressed in milligrams per deciliter (mg/dL) or millimoles per liter (mmol/L). Regardless of when you last ate, a random blood sugar level of 200 mg/dL (11.1 mmol/L) or higher suggests diabetes, especially when coupled with any of the signs and symptoms of diabetes, such as frequent urination and extreme thirst. A level between 140 mg/dL (7.8 mmol/L) and 199 mg/dL (11.0 mmol/L) is considered pre-diabetes, which puts you at greater risk of developing diabetes. A blood sugar level less than 140 mg/dL (7.8 mmol/L) is normal. Fasting blood sugar test. A blood sample will be taken after an overnight fast. A fasting blood sugar level less than 100 mg/dL (5.6 mmol/L) is normal. A fasting blood sugar level from 100 to 125 mg/dL (5.6 to 6.9 mmol/L) is considered pre-diabetes. If it's 126 mg/dL (7 mmol/L) or higher on two separate tests, you have diabetes mellitus. From 100 mg/dL (5.6 mmol/L) to 125 mg/dL (6.9 mmol/L) is considered pre-diabetes, which puts you at greater risk of developing diabetes. Oral glucose tolerance test. For this test, you fast overnight, and the fasting blood sugar level is measured. Then you drink a sugary liquid, and blood sugar levels are tested periodically for the next several hours. A blood sugar level less than 140 mg/dL (7.8 mmol/L) is normal. A reading of more than 200 mg/dL (11.1 mmol/L) after two hours indicates diabetes. A reading between 140 and 199 mg/dL (7.8 mmol/L and 11.0 mmol/L) indicates pre-diabetes. Overweight children who have other risk factors for diabetes, starting at age 10 and repeated every two years. The Eyes: Diabetes can cause damage to the blood vessels within the eyes which can cause cataracts, glaucoma, retinopathy and in sever cases even blindness. A diabetic retinopathy can be managed by laser eye treatment, however this will only preserve the sight you have and not return sight that has been lost. It is important to have regular check ups with an optician to monitor any changes to the eye. The Nervous System: Too much glucose in the blood stream can cause damage to the small blood vessels within nerves. This can cause numbness, tingling, and pain especially in the hands and feet. One may lose sensation in these areas, which can lead to sores, and possibly amputation. If it affects the nerves in the digestive system then the patient may suffer from nausea and vomiting, diarrhoea or constipation. The Heart: Those with type 2 diabetes are up to five times more likely to develop some form of heart disease. extended periods of time with badly controlled glucose levels can cause atherosclerosis, a narrowing of the vessels, leading to a poor blood supply to the heart, ultimately causing angina. 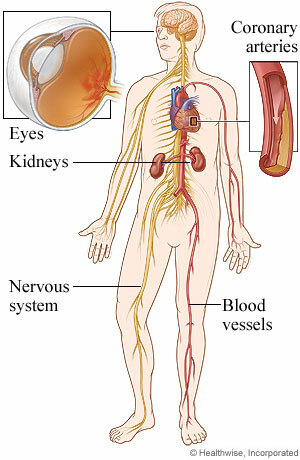 If the blood vessel is blocked it will cause either a heart attack or stroke, dependant on where the vessel leads to. At this moment in time there is no current cure for diabetes, there is only treatment available to help keep the blood glucose levels as normal as they possibly could be in order to help prevent further complication later on in life. Medications will not be the first choice for your GP to refer you onto, first of all they will recommend a change in diet, and increase in physical activity and a decrease in weight to help manage the diabetes without the need for drugs. Given that type 2 diabetes will usually get worse over time, those with type 2 diabetes will eventually be placed on some kind of medication to help with the management of their diabetes. There are a number of different medications that can be used to control blood glucose levels but the most commonly known is Metformin. Damage to the nervous system is a systemic problem that may occur with diabetes. Foot neuropathy is common in patients with diabetes, therefore diabetic foot care is an important aspect of the medical management of diabetic patients. Numbness and tingling of the feet can cause foot injury and wounds to go unnoticed, which may lead to breakdown and infectious wounds of the skin. Damage to the nervous system also impairs sweat secretion and oil production of the foot. If proper lubrication of the foot does not occur, this leads to abnormal pressure on the skin, bones, and joints during walking and will also result in skin breakdown and sores on the foot. 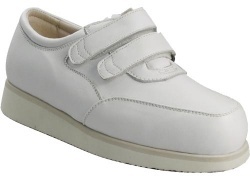 Diabetic patients must be aware how to prevent foot problems before they happen. Treatment for diabetic foot problems have recently improved, but prevention remains the best way to prevent complications. Diabetic patients need to learn how to properly examine their own feet and be able to recognize early signs and symptoms of diabetic foot problems. The National Institute for Health and Care Excellence (NICE) team are releasing four new guidances relating to diabetes management by August 2015. Type 2 diabetes often occurs in children and adults who are over weight and live a sedentary lifestyle. It is shown that approximately 80% of patients receiving physical therapy services have diabetes, pre diabetes, or at least one risk factor for type 2 diabetes.Physical therapist can utilize exercise programs as an effective treatment for patients with type 2 diabetes and it has been proven that regular physical activity is crucial to in sustaining low blood sugar levels and improving insulin sensitivity. An exercise program for patients with type 2 diabetes should included combined endurance, aerobic, and resistance training. Patients should perform an aerobic exercise program 3-5 days per week and for 150 minutes per week at mid to moderate intensity (RPE 10-12/20). A resistance training program should also be preformed for all major muscle groups 2-3 days per week. If patients have peripheral neuropathy, a common condition in type 2 diabetic patients, non weight beating activities should be performed. Resistance training has shown to improve strength and endurance, enhance flexibility, improve body composition, decrease risks for cardiovascular disease, improve glucose tolerance and insulin sensitivity. Patients should complete 8-12 reps per set and progress from 1 set to 3 sets, resting 30 minutes per set. Aerobic and resistance training as shown to decrease A1C levels by 0.8 or 3% in 12 weeks. Patients should avoid skipping exercise for more than 2 days at a time in order to prevent deterioration of glucose tolerance and insulin sensitivity. While exercising with patients that have type 2 diabetes it is important to also check their blood sugar before exercise, every 30 minutes during exercise, after exercise, and four hours after exercise. If a patients blood sugar is <70 mg/dL before exercise, give them 15 grams of a carbohydrate snack, recheck in 15 minutes, and if above 70 mg/dL continue with exercise. If a patients blood sugar is between 70-150 mg/dL, give them 15 grams of a carbohydrate snack every hour of performed moderate intensity exercise. If blood sugar is between 100-300 mg/dL, it is safe to exercise. If blood sugar is >300 mg/dL and the patient is on oral medications, do 15 minutes of exercise and check again. If blood sugar rises, stop exercise, if it drops, continue. If blood sugar is >300 mg/dL and the patient is on insulin, it is important to check for ketones. If ketones are positive, stop exercise. ↑ National Diabetes Information Clearinghouse (NDIC). Insulin resistance and prediabetes. http://diabetes.niddk.nih.gov/dm/pubs/insulinresistance/#resistance (accessed 5 May 2015). ↑ 3.0 3.1 3.2 3.3 3.4 3.5 Diabetes UK. Diabetes risk factors. https://www.diabetes.org.uk/Guide-to-diabetes/What-is-diabetes/Know-your-risk-of-Type-2-diabetes/Diabetes-risk-factors/ (accessed 5 May 2015). ↑ International Diabetes Federation (IDF). Diabetes: facts and figures. https://www.idf.org/worlddiabetesday/toolkit/gp/facts-figures (accessed 5 May 2015). ↑ Guariguata L, Whiting DR, Hambleton I, Beagley J, Linnenkamp U, Shaw JE. Global estimates of diabetes prevalence for 2013 and projections for 2035. Diabetes Research and Clinical Practice 2014;103:137-49. ↑ International Diabetes Federation. Diabetes: facts and figures. https://www.idf.org/worlddiabetesday/toolkit/gp/facts-figures (accessed May 5 2015). ↑ 7.0 7.1 7.2 Guariguata L, Whiting D, Hambleton I, Beagley J, Linnenkamp U, & Shaw J. 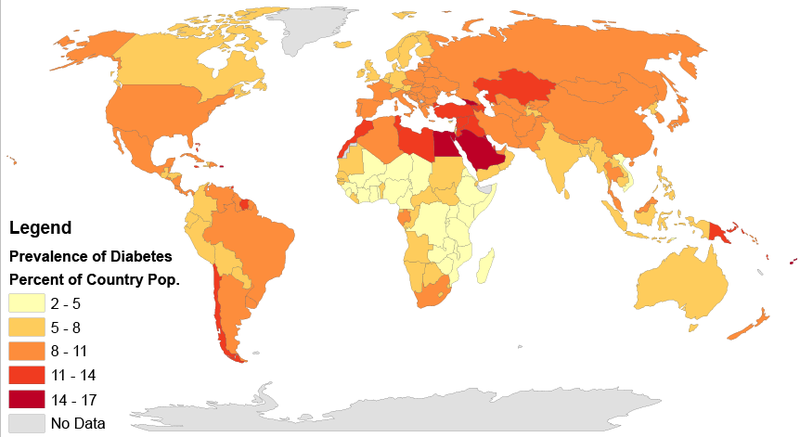 Global estimates of diabetes prevalence for 2013 and projections for 2035. Diabetes Research and Clin Pract 2014;103:137-49. ↑ World Health Organization (WHO). Diabetes programme. http://www.who.int/diabetes/en/ (accessed 5 May 2015). ↑ World Health Organization. Diabetes: fact sheet (accessed May 5 2015). ↑ Connolly V, Unwin N, Sherriff P, Bilous R, Kelly W. Diabetes prevalence and socioeconomic status: a population based study showing increased prevalence of type 2 diabetes mellitus in deprived areas. Journal of Epidemiol Coomunity Health. 2000; 54: 173–177. ↑ Pettitt DJ, Talton J, Dabelea D, Divers J, Imperatore G, Lawrence JM, Liese AD, Linder B, Mayer-Davis EJ, Pihoker C, Saydah SH, Standiford DA, Hamman RF. Prevalence of diabetes in U.S. youth in 2009: the search for diabetes in youth study. Diabetes Care 2014; 37:402-08. ↑ Pettitt D, Talton J, Dabelea D, Divers J, Imperatore G, Lawrence J, Liese A, Linder B, Mayer-Davis E, Pihoker C, Saydah S, Standiford D, & Hamman R. Prevalence of diabetes in U.S. youth in 2009: the search for diabetes in youth study. Diabetes Care 2014;37:402-408. ↑ Okosun I, Chandra KM, Choi S, Christman J, Dever GE, Prewitt TE. Hypertension and Type 2 Diabetes Comorbidity in Adults in the United States: Risk of Overall and Regional Adiposity. Obesity Research. 2001; 9: 1–9. ↑ Laffel L, Svoren B. Comorbidities and complications of type 2 diabetes mellitus in children and adolescents. Wolters Kluwer Health. 2007; 369(9575):1823. ↑ National Diabetes Information Clearinghouse. The A1C test and diabetes. http://diabetes.niddk.nih.gov/dm/pubs/A1CTest/#1 (accessed May 5 2015). ↑ 22.0 22.1 22.2 22.3 22.4 Bonora E, Tuomilehto J. The pros and cons of diagnosing diabetes with A1C. Diabetes Care 2011;34:S184-90. ↑ 26.0 26.1 26.2 26.3 26.4 NHS Quality Improvement Scotland. Scottish Intercollegiate Guidelines Network. Management of Diabetes: A national clinical guideline. 2010. ↑ NICE. Type 2 diabetes. https://www.nice.org.uk/guidance/indevelopment/gid-cgwave0612 (accessed 25 May 2015). ↑ 31.0 31.1 31.2 31.3 American College of Sports Medicine. ACSM's Guidelines for Exercise Testing and Prescription. 8th ed. Lippincott Williams and Wilkins; 2009.